Viscount Clifden; Christie's, London, 5 May 1893, lots 148-9 (410 gns. to Philpot). Sir Harold Wernher, 3rd Bt. (1893-1973), Bath House, London; after 1948, Luton Hoo, Bedfordshire, in the Hall, subsequently in the Saloon, and by descent. 1913 Bath House Inventory, p. 103, no. 497, in the Parquet Hall. 1949 Luton Hoo Inventory, p. 4, in the Hall. Jacques-Laurent Cosson, maître in 1765. 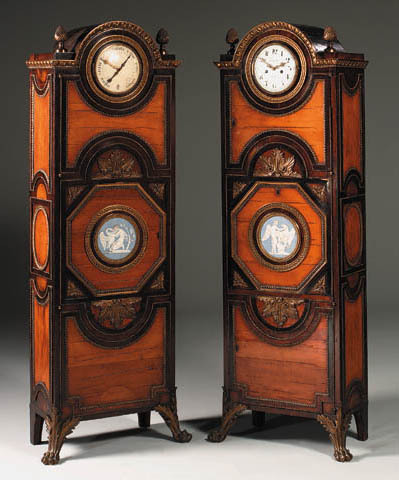 These impressive cabinets, conceived in the 'antique' taste of the 1780s and 1790s, are embellished with poetic Sèvres medallions after the English fashion for jasper wares promoted by Josiah Wedgwood's Etruria factory - the goût anglais promoted by influential collectors such as the comte d'Artois, the brother of King Louis XVI, a taste that was made more accessible in France following the treaty between France and Great Britain in 1783. The subjects of the jasperware plaques derive from Ovid's Metamorphoses, and celebrate Jupiter, with depictions of his seduction of Leda (through his assumption of the form of a swan) and abduction of Ganymede (in the form of an eagle). The Leda medallion derives from a design of 1794 for the Sèvres porcelain factory by Louis-Simon Boizot (d. 1809), while the Ganymede medallion relates to an antique sculpture in the Uffizi, Florence (see J. Saslow, Ganymede in the Renaissance, London, 1986, fig. 4.3). These splendid cabinets are likely to have belonged to Henry George Agar-Robertes, 3rd Viscount Clifden (d. 1866), who succeded as 3rd Baron Dover in 1833, and whose marriage took place in 1861 to Eliza Horatia Frederica, daughter of Frederick Charles William Seymour and great-granddaughter of the 1st Marquess of Hertford (d. 1794), of the famous family of collectors. It is likely that the alterations to these cabinets were undertaken at around the time that he acquired them. When sold in these Rooms by Viscount Clifden in 1893, it was stated that much of his collection had formerly been in the 'Collection of the late Right Hon. Lord Dover, at Whitehall'. Dover House, built in the reign of George II, was known in the early 19th century as York House and then Melbourne House. It was first occupied by Lord Dover in 1847, and remained in the possession of his family until 1885, when it reverted to the Crown and was occupied by the Scottish Office.